July until September or October is the time to take cuttings for propagation of some of your prized shrubs and trees. This is a good way for frugal gardeners to increase their number of plants. Another thought, trade your cuttings with gardener friends for cuttings from their shrubs and trees. Here’s a short list of some shrubs to root this time of year: Abelia, azalea, barberry, boxwood, camellia, cedar, daphne, forsythia, juniper, Leyland cypress, pyracantha, flowering quince, rhododendron, rose, and yew. Small trees that can be rooted now include crabapple, crape myrtle, flowering cherry, dogwood, poplar, and willow. And clematis, the queen of the flowering vines, will root now, too. 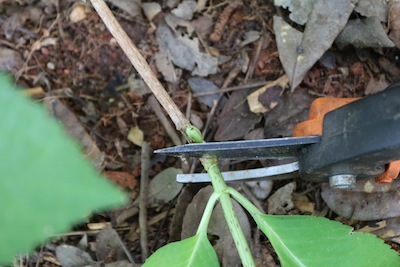 Cuttings this time of year, called semi-hardwood cuttings, should be from the current season’s growth. Look for a difference in the bark color and texture from one season to the next. The wood should be firm and not bend easily but not be so stiff that it breaks when you bend it. The leaves should be fully open. If the tip bends easily, trim it off so that the whole piece is stiff. Fill plastic pots with peat, sand, perlite, or vermiculite. I cover the bottom holes in the pots with coffee filters, and then add my planting mix. You can also use broken clay pots or gravel. I prefer plastic containers because they will not dry out as quickly as clay pots. If you are a busy Lizzie, intent on watering your pots several times a day, then by all means use clay. Its porous-ness might save your cuttings from rotting. I like to take large cuttings so that I start out with large shrubs or trees, rather than something a couple inches tall, so I use gallon pots for my cuttings. If your cuttings are just a few inches long, then use a small container, four inches or so, to fit their size. Take your cuttings first thing in the morning before they are stressed out from the heat of the day. Carry a wet paper towel in a plastic bag with you into the garden and put the cut ends of your snips into the moist baggie. Don’t lay them down in the sun – cooked cuttings could be the result. Be sure to take more cuttings then you want to grow since some will not root. If you want half a dozen boxwoods, then prepare a dozen cuttings. Remove all of the leaves and any flowers or buds. If you can’t bring yourself to do this, then remove the bottom sets of leaves. You want at least two sets of nodes (where the leaves were growing on the stem) bare to bury in the potting medium. The leaves left on the stem will most likely turn black and/or drop off. This is normal. The plant needs its energy to develop roots and often will chuck the leaves. It takes energy to maintain the leaves, too, energy better spent on root building. 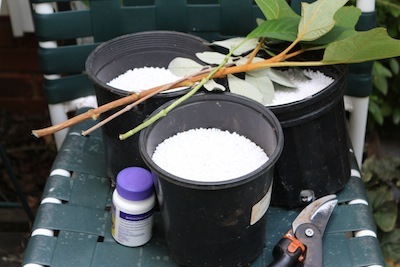 Moisten your potting mix thoroughly before you “stick” your cuttings. Be sure to stir up the potting mix to make certain it is damp all the way through. This is especially important when using peat. It can be wet on top and have water running out the bottom, but all of the interior might still be dry. Dip the cutting’s damp end into a rooting hormone powder or liquid, being sure to follow any label directions, use a pencil to make a deep planting hole in the pot, and slip the cutting into the hole. Water it in to fill in all of the air pockets around the stem. Be sure to slip a label with the plants name and the date in each pot. Set the pots in the shade and check them daily. Water them whenever the top of the soil dries out. By next spring, you should have new plants for your garden or to share with visitors.